Silicon Valley has a long tradition of companies born in garages of suburban homes. Bill Hewlett and David Packard gave birth to this tradition and in fact, to “Silicon Valley” itself when they started what would become Hewlett-Packard back in 1939 in a wooden garage in Palo Alto. Steve Wozniak and Steve Jobs continued that tradition when they started Apple in the garage of Jobs’s parents in Los Altos in 1976. Andrew Frazier, founder of Thyrm LLC, has followed in the tradition of garage-bound inventors in Sunnyvale, California; about a mile north of where Apple’s current headquarters sits. 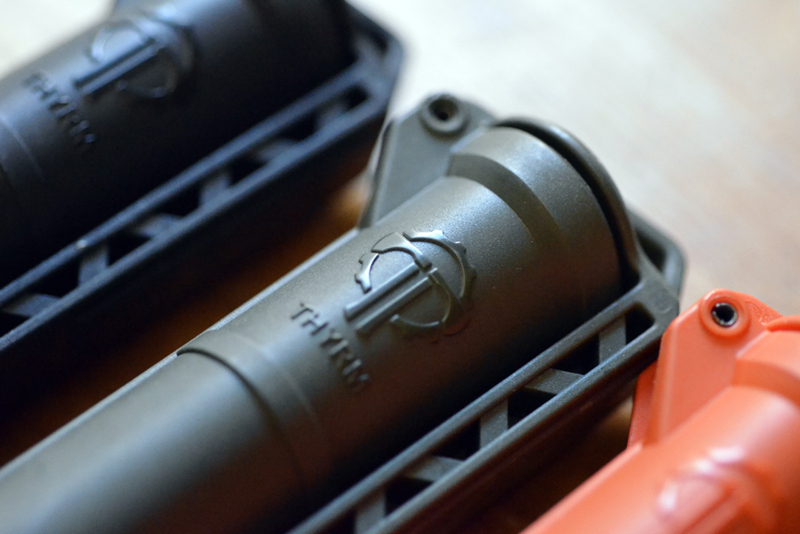 Unlike other Bay Area garage startups, however, the problems Thyrm is most interested in solving are those that affect people engaged in force of arms professions. Born in Canada to one American and one British parent, US citizen Andrew Frazier grew up in the Portland, Oregon before finding himself designing medical technology devices in the Bay Area. This “day job” afforded him the income to pursue his various hobbies, one of which is competitive shooting. Throughout a given work week, Frazier practiced his shooting and kept abreast of developments in the tactical industry before and after going to work. It was during a national IDPA competition that Frazier first encountered a problem he would later focus on developing a technical solution to, low-light shooting. Having practiced the various aspects of shooting handgun, Frazier found himself with a new set of problems when using a flashlight in conjunction with his pistol. Holding a second device changes how you grip the handgun. Using the flashlight to illuminate your target takes practice and forces you to alter the fundamentals of your shooting habits in order to be effective. His idea came about through thinking about better management of hand-held flashlights in such situations. Invention being born out of necessity, Frazier then set about building a prototype, which he demonstrated to SureFire executives. 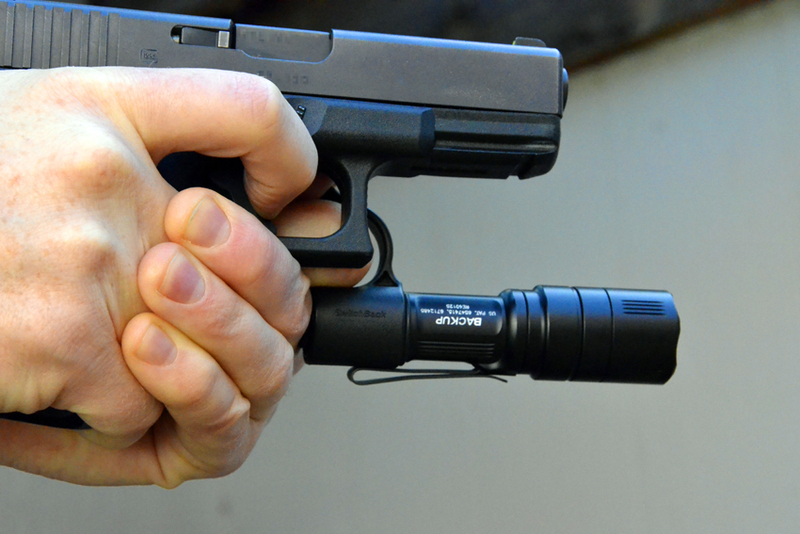 At that time, the prototype consisted of a combined finger ring and tail-cap, which allowed the shooter to quickly deploy a flashlight, flip it around into a forward-facing position with one’s off-hand, while still maintaining a proper two-hand grip on the handgun. SureFire showed initial interest, but Frazier said they eventually backed away from the potential joint venture and he ended up training with Chris Costa, showing him the idea. The two ended up working together, refining the design and the end result was the co-branded Costa-Ludus / Thyrm Switchback. 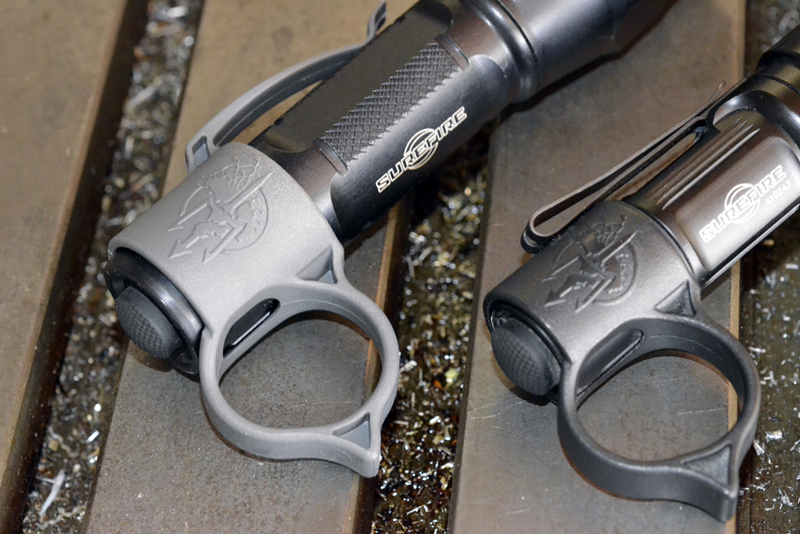 The Switchback consists of the original ring, with an additional clip that allows the flashlight to be easily deployed from a pocket and immediately put into use with a natural two-handed grip. 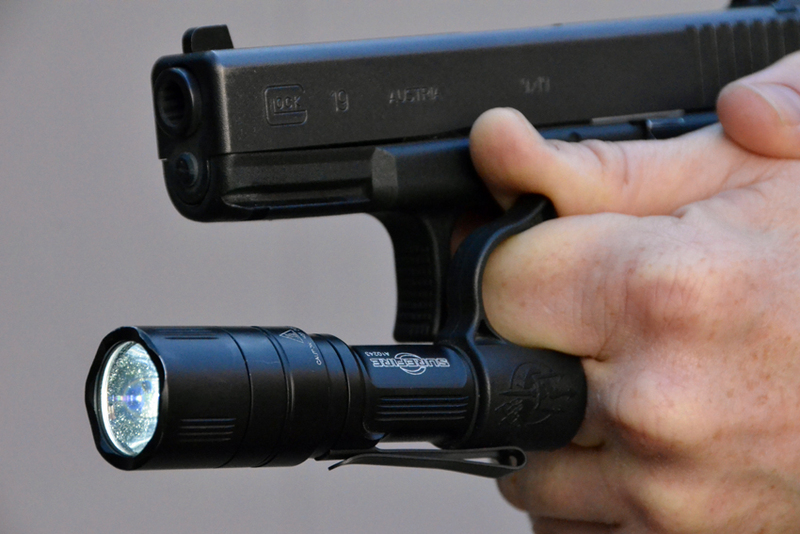 It also allows the user to sweep the surrounding area without adjusting their hold on the flashlight. 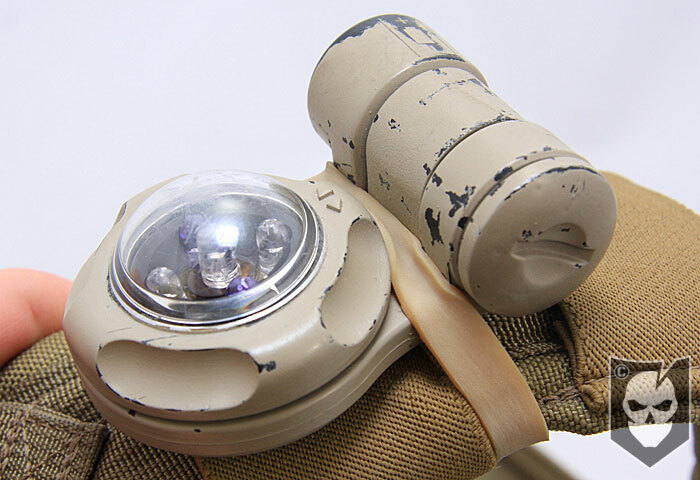 The Switchback is distinct from other flashlight rings with its thumb ridge, allowing thumb pressure to activate the light by applying backward pressure to the light against the back of the second finger. 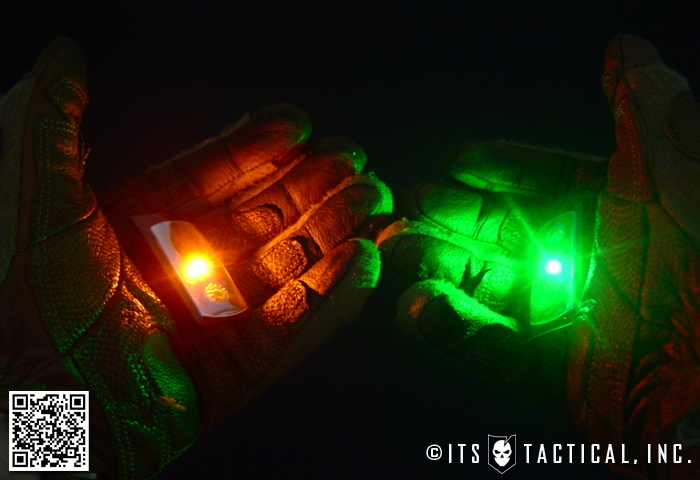 This is much the same way one might use their thumb to activate a weapon-mounted light. There are plenty of videos online that do a much better job of demonstrating this process and technique than can be described in text. 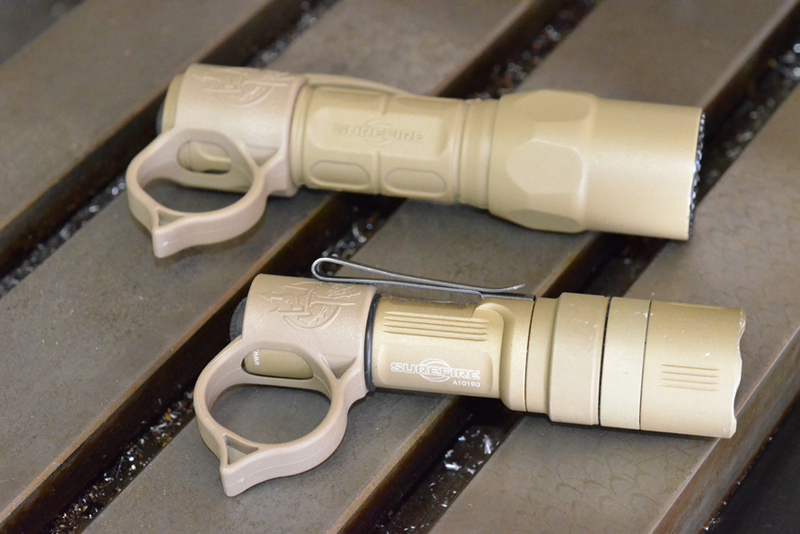 There are two versions of the Switchback available now; the Large, which fits most 1” diameter flashlights (like the SureFire PX2 Fury) and the Backup, which fits the SureFire EB1 or EB2 Backup lights. 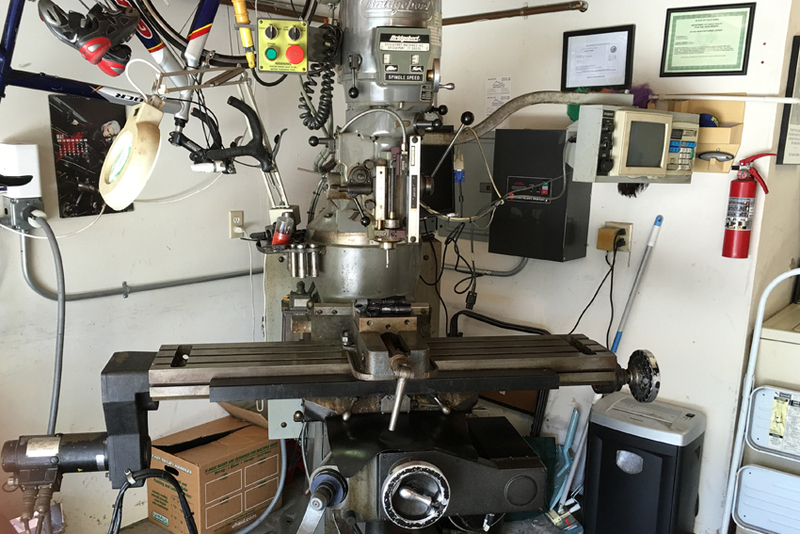 Andrew’s design process involves developing the plans in CAD software at home, using his garage equipment to develop a prototype and eventually having injection-molded prototypes developed in the Midwest. 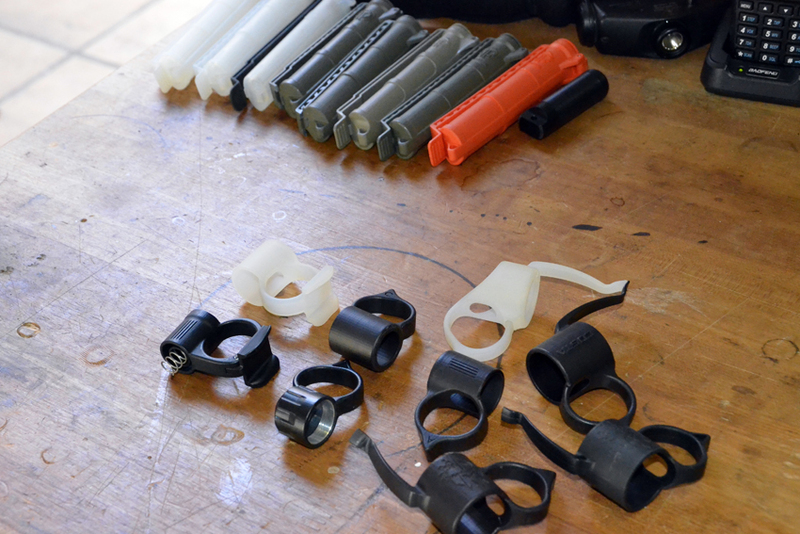 These prototypes are then shipped back for review, refinement and testing. Thyrm involves the entire Frazier family. Andrew handles the design work and marketing, his wife, a Silicon Valley teacher and Java developer, develops their website and store infrastructure while also managing remote fulfillment operations and customer service. Long-time friend and best man at the Frazier’s wedding, Scott Noble, provides marketing and sales support for a total in-house head count of three. Design and testing takes place in Sunnyvale, while production, prototyping and fulfillment takes place in Ohio and Chicago. 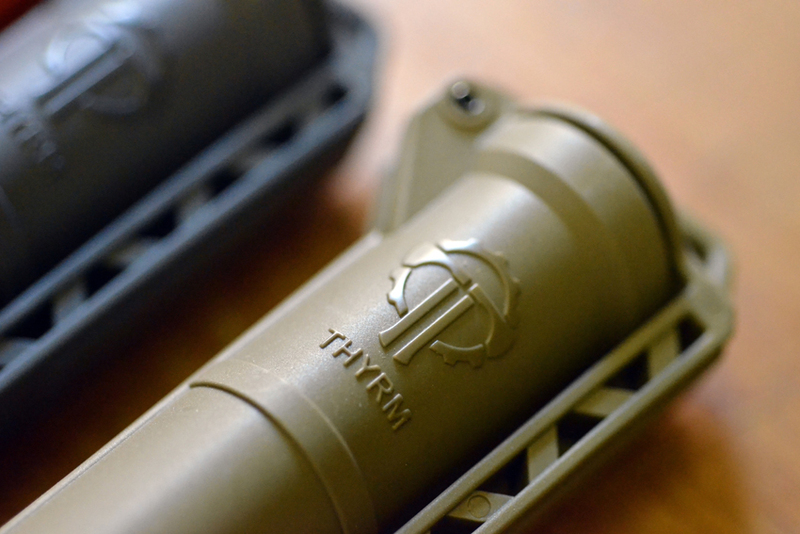 While the various aspects of the company may be distributed and in some ways “virtual,” all Thyrm products are 100% American-made. 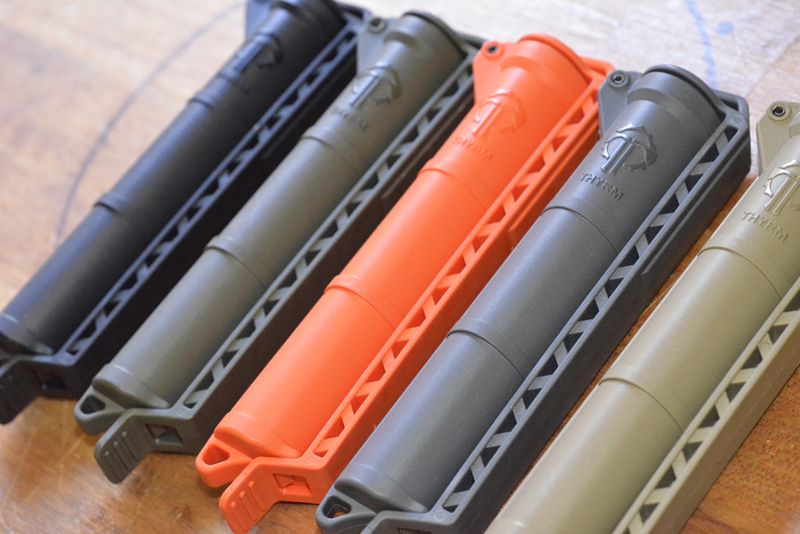 After the release of the Switchback, Thyrm subsequently turned their design efforts to creating the Cell Vault, a waterproof battery storage device that mounts easily on one column (and two rows) of available MOLLE webbing. 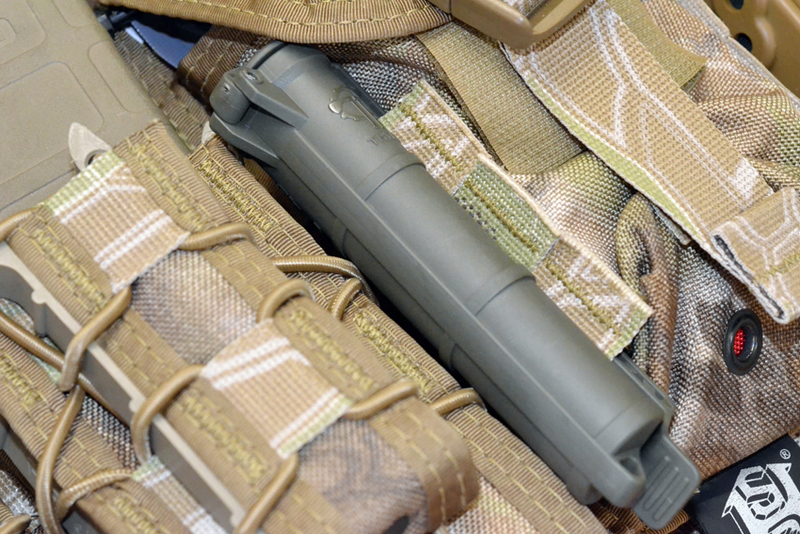 This allows you to carry three CR123 batteries, two AA batteries or 4 AAA batteries, while only losing one column of MOLLE on a chest rig, plate carrier or rucksack. The Cell Vault also clips onto a belt, strap or other spots you may want spare batteries on-hand. 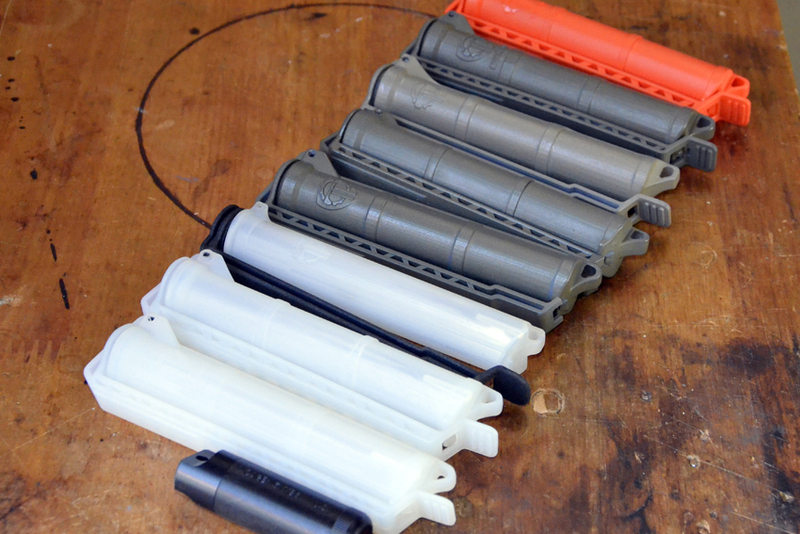 It offers ready to swap out fresh batteries for dead batteries, while keeping them protected from the elements. 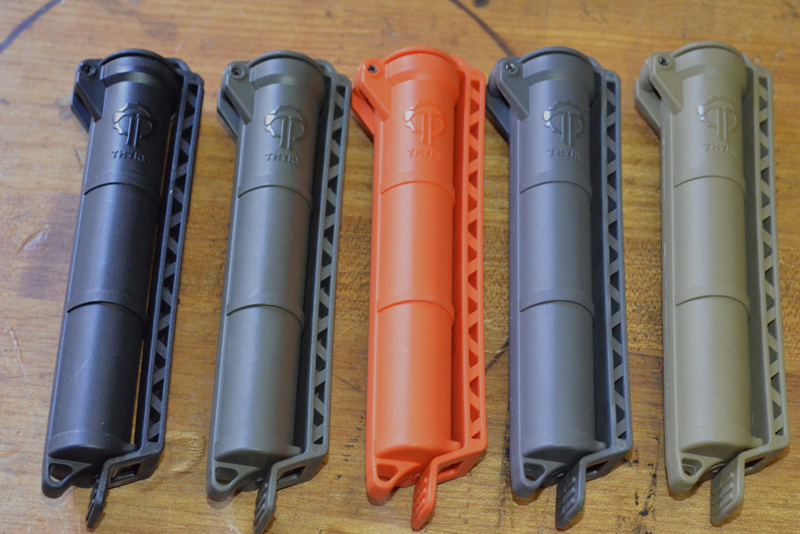 It doesn’t have to store just batteries though, there are all sorts of survival-oriented uses. From keeping matches, ear plugs, fire starting materiel, fishing line, medicine, small USB storage devices, MicroSD cards or anything else you don’t want getting wet. I’ve been using the Cell Vault I purchased a few weeks ago for a variety of different purposes. 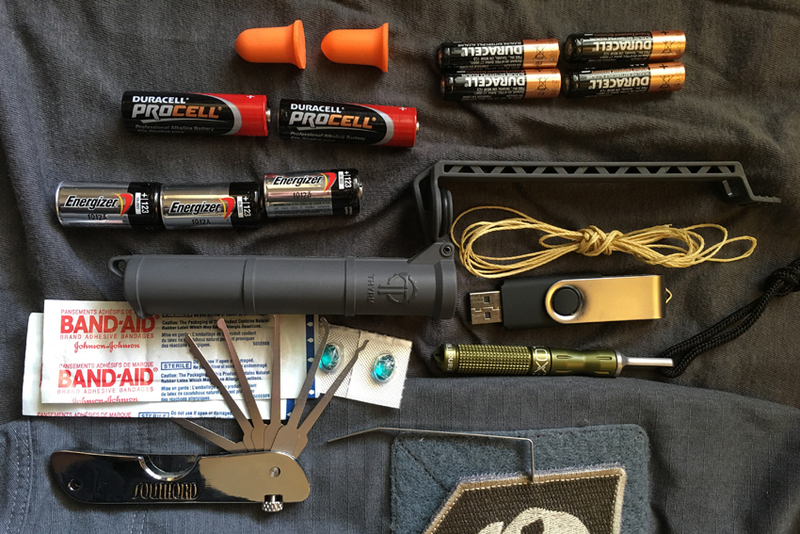 I’ve attached it to one column of MOLLE on a pack to keep spare batteries for a headlamp during night time bike rides and I found it extremely easy to manipulate without even taking the pack off in order to change the batteries out. If attached in the right-side up position, the latch at the bottom is first unhitched, allowing the tube to fold upward, at which point the batteries come out. If for some reason the latch were to come undone from jostling, the contents of the Cell Vault won’t fall out, unless you’ve managed to invert yourself somehow. However, at that point you’ve probably got bigger problems than grappling for spare batteries. I’ve also taken to stuffing it with a tube of antibiotics, a few bandaids, a couple of rolled twenty dollar bills and dry matches. I was curious about how rugged it was and though I no longer have access to a 9 ton Ford F-650 that I did with a previous job, I did intentionally run over it with the family car. I found it structurally fine, with only a couple of scuff marks from the incident. In addition, I dropped it off a third floor balcony with batteries in it and it remained undamaged and better still, remained closed with the batteries still safely enclosed inside. It also works nicely as a belt attachment and is largely unnoticeable when worn in this manner. Some people may be concerned that storing batteries end to end may result in energy drainage over long periods of time. This aspect hasn’t been specifically tested by either Thrym or myself, but my understanding is because Cell Vault is not made of a conductive material, a complete circuit is not created and the batteries should remain fully charged for their duration in storage. Much like when the batteries are stored inside a flashlight without the tail cap being activated. However, if this is a concern for you, there are a few options to make sure potential drainage doesn’t happen. The first option would be to alternate the polarity of the batteries in storage, such that positive and negative ends don’t touch each other. 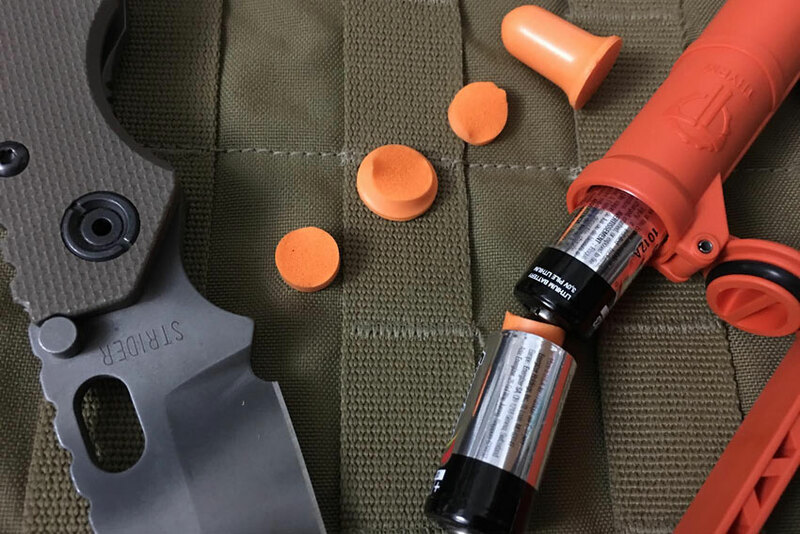 The second option would be to take a foam ear plug, cut it into slices and insert those between each battery, creating a barrier that prevents the batteries from contacting each other. I’ve done this with AA batteries to prevent them from sliding around inside the Cell Vault and making noise during jostling or significant up/down movement. We visited Frazier in Sunnyvale to get a look at what he’s already developed and also to get a feel for what might be next for Thyrm. 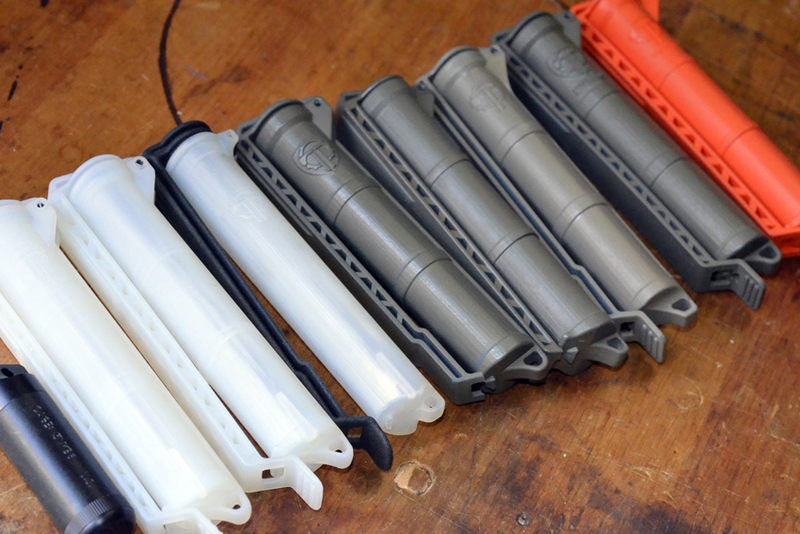 He showed us the prototypes of both the Switchback and the Cell Vault, as well as a prototype for something he’s working on as a future product; low-profile injection-molded magazine carriers. We didn’t take photographs of those, as they’re still in the development phase, but the obvious advantages of injected-molded solutions over standard nylon pouches or Kydex solutions would be the compactness, durability and better yet, reduced cost of manufacture that would in turn reduce cost to the customer. Thyrm is also working on developing devices for military and civilian medical first responders, gathering feedback from those in the field in order to try and solve technical problems to help them be more effective in saving lives. Development in this area is something that would allow Frazier to bring together his professional experience designing medical devices with his longstanding interest in shooting, tactics and preparedness. As sales of the existing products increase and development of new products continues, the Frazier family finds themselves increasingly feeling the pressure of balancing their day jobs with their garage-based business; potentially getting closer to Thyrm needing to expand as a company. Regardless of what may come, it’s safe to say that Andrew Frazier and Thyrm, LLC are going to keep inventing solutions for problems faced by those who go into harm’s way. From the looks of it, they’re going to keep succeeding in these efforts. That’s not only a prime example of the garage-inventor spirit of Silicon Valley being alive and well, it’s the American Way.